As I sit watching the Oscar’s and writing this post I can’t help but feel slightly less than glamorous….but let me tell you, I sure was comfortable! Let me start with this t-shirt. A few weeks ago I discussed the basic tee and shared some of my favorites that I tend to slightly splurge on. Well, this just goes to show me that there are always exceptions…always. I love Old Navy but typically don’t have luck with their t-shirts. This one however, is a different story. It has a great weight to it and the quality really impressed me. It has a loose, boyfriend fit but at the same time lays really well. I’m still nursing, so t-shirts are my best friend and I’m now contemplating getting more colors. We had a 60 degree day yesterday and I’m hoping this wasn’t a tease but more of a sneak peak of what’s to come. 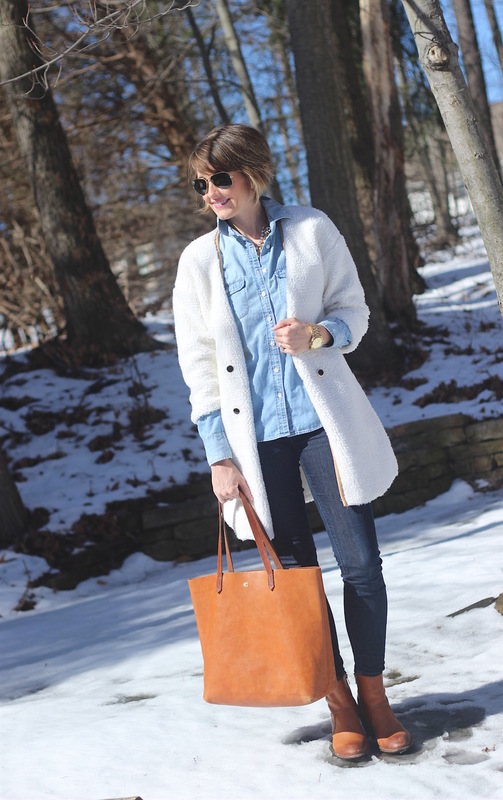 Breaking out my jean jacket and ecru pants without having to worry about getting snowy slush on them was a dream! Keep it up Mother Nature, I’m on board. 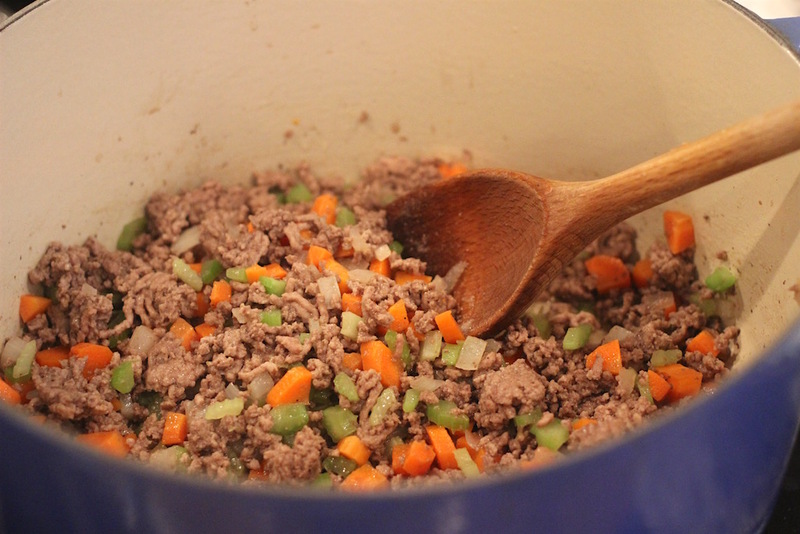 In a large pot or Dutch oven, saute the beef and salt on high heat until browned, breaking the meat up into small bits. Add the onion, celery and carrots and saute 3 to 4 minutes. 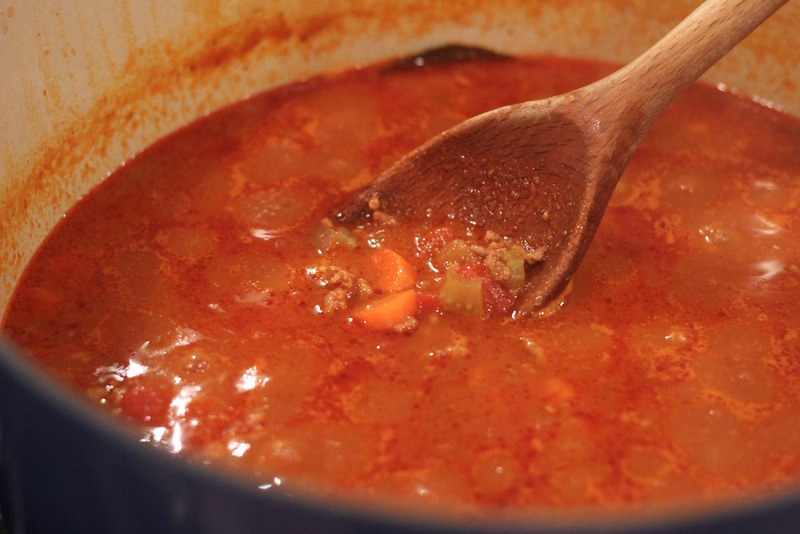 Add the tomatoes, stock and bay leaves, cover and cook low until the beef and the vegetables are tender, about 1 to 1 1/2 hours (you may need to add more broth or water if it evaporates too much). 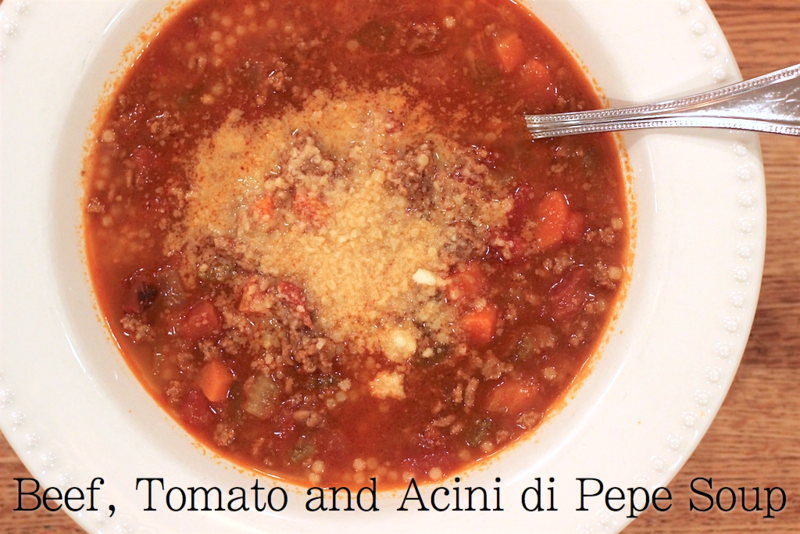 Cook pasta according to package directions, drain and add to soup. 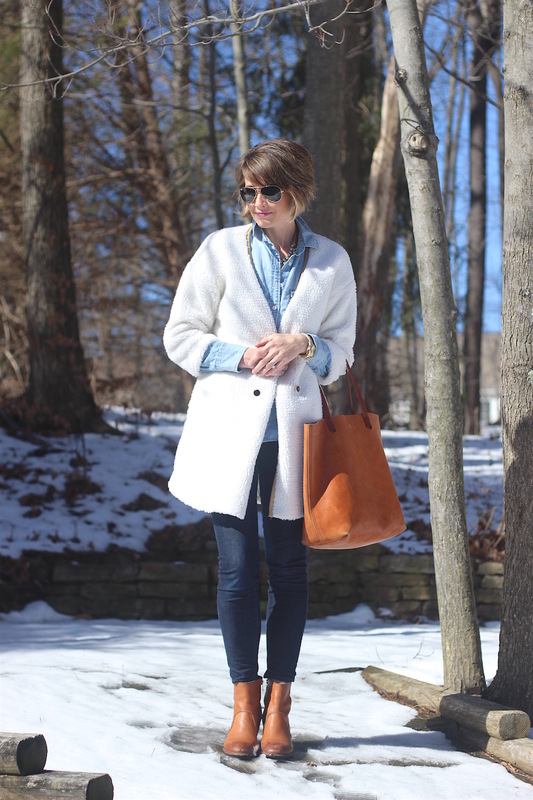 As eager as I am for warmer weather, I also know I’ll quickly be missing all the fun of layering outfits when the temperatures rise. 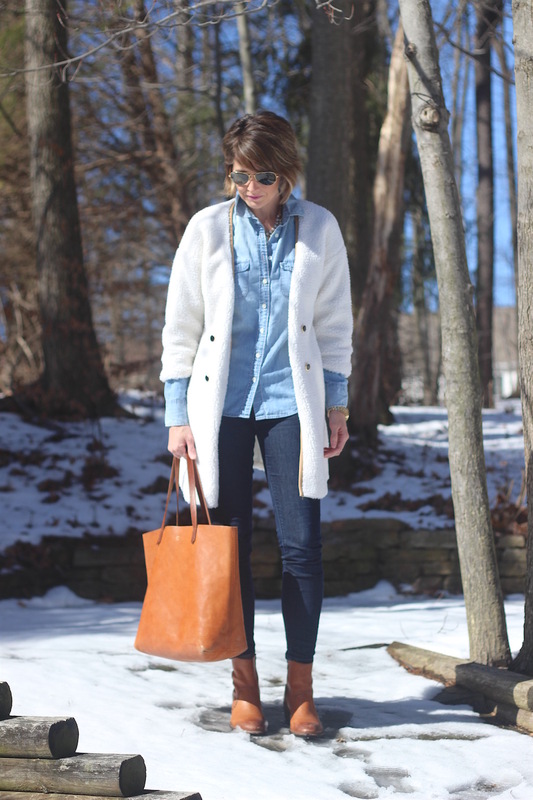 You may remember the sherpa vest I wore here and continue to throw on regularly. 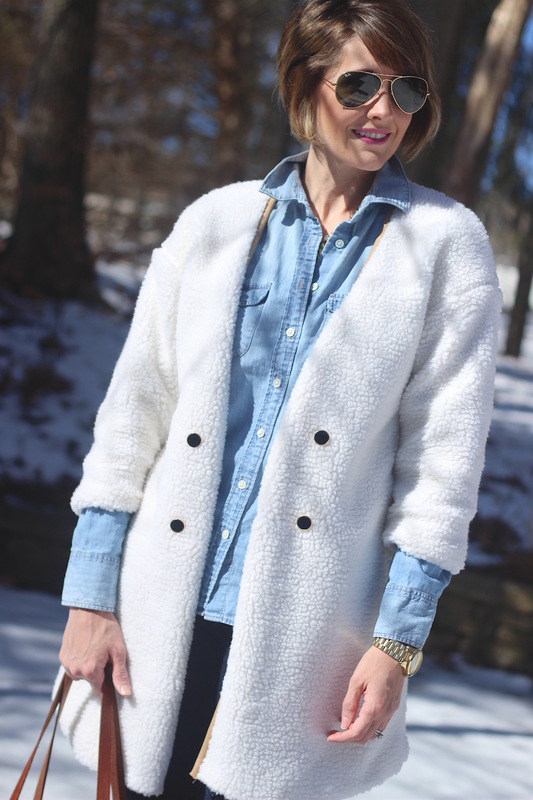 I knew I’d enjoy wearing this (faux) shearling coat as well as it can enhance even the simplest outfit of denim on denim. 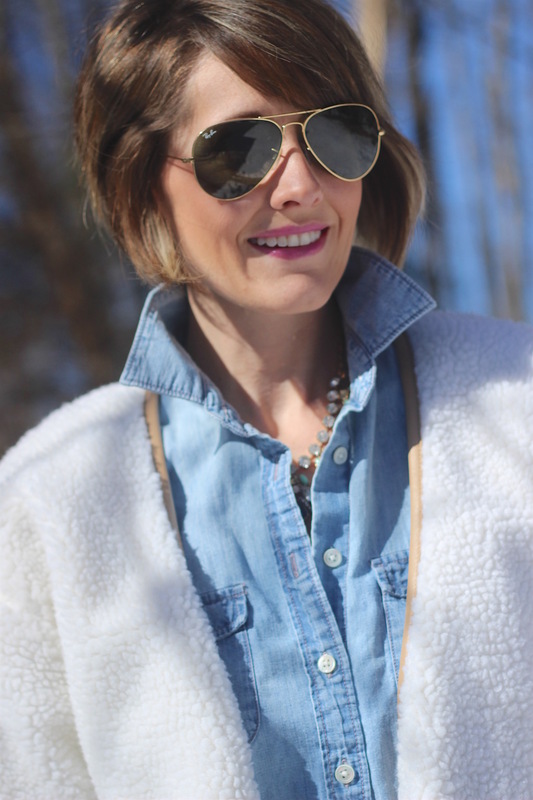 I’ve gathered a few other fun shearling pieces for you to check out below. 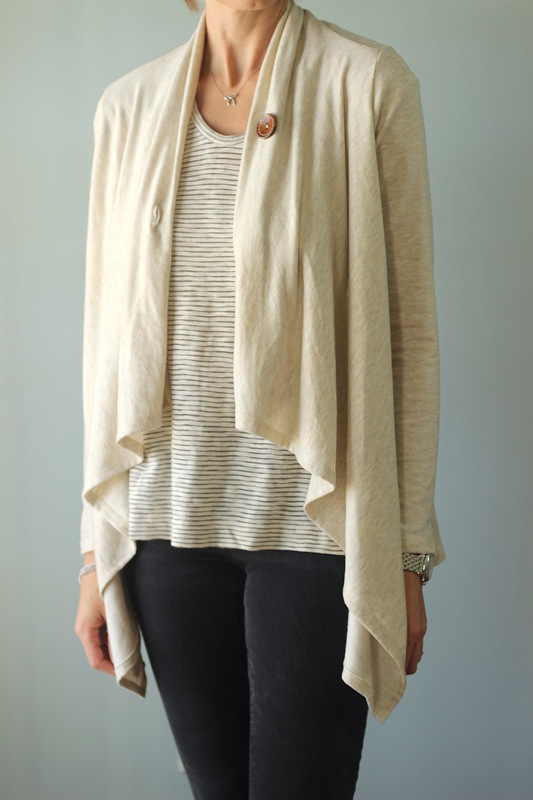 Maybe one will fit into your style and enhance your layering while you still can! Has anyone else been feeling a little trapped and stir crazy from the snow/ice/rain lately? It forced me to tackle an indoor shoot (which isn’t my preference, I’d much rather put on a freezing smile outdoors! ), but it is what it is. You might recall me posting about my favorite fleece cardigan a few months ago. Well, with as much wear as it gets I decided to grab a lighter weight one for the upcoming warmer months. I also wanted a more versatile color in hopes that people won’t notice when I wear it a little too often ;) It’s a fun layering piece, makes a great nursing cover (especially when your 9 month old wants nothing to do with actual nursing covers, or nursing much at all for that matter because they are distracted by everything around them! ), and is great for basically any age group. I also recently bought this striped tee at LOFT. My first official spring purchase and I look forward to wearing it un-layered in the future. I love art work but I always struggle with it. Finding pieces that not only I love, but my family as well can be a difficult task. I’m much more prone to hang photography around our house because we’ve been fortunate to have talented friends and family members capture some sweet memories over the years. There’s nothing like our wedding pictures or newborn photography or my children’s goofy grins to bring a smile to my face when I pass them daily. But I also realize that art work can add a beautiful element to a home. Since it’s slightly out of my comfort zone, I figured I’d start with the children. I’ve had some luck at HomeGoods lately and I love how Minted has really stepped up their game in this department as well. Or maybe they always have and I’m just now realizing it?? Etsy is also a great resource but it takes some time to do the sorting and scrolling! 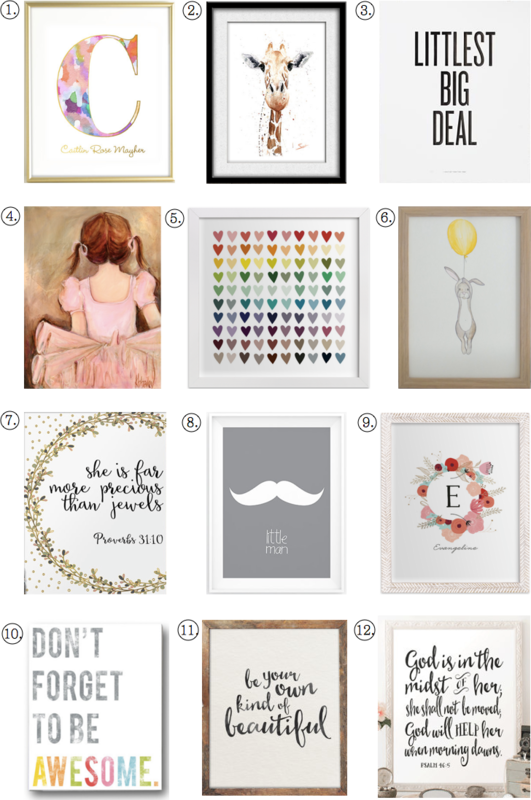 Here are some of my favorites that I came across that would be a perfect addition to any children’s room or nursery. Do you have any art resources that you’ve had luck with? I hope you all had a great weekend and a very sweet Valentine’s Day! Jack and I managed to get out for a lunch date and an afternoon of running around town. It’s always a treat to spend one on one time with him without being interrupted mid- sentence…every sentence, ha! It was a beautiful weekend, but boy was it cold! As in way below freezing bundled in down and every cold weather accessory I own kind of cold. Needless to say we didn’t have a chance to do any shoots outdoors, but I’ve been taking note of all the beautiful dresses and jumpsuits that have been rolling out lately. I’m currently helping to style someone for an upcoming wedding but the problem is that new options keep coming out daily making it extremely difficult to narrow things down! With Easter and wedding/shower season on the horizon I figured I’d share some of the many options that have crossed my mind. After all the groundhog did say we’d have an early spring, right?! Since moving last year, home decor has been on my mind non-stop. We’re tackling it all little by little which is good because I’m kind of known for changing my mind about things. My husband just loves that (read sarcasm). Oh and I’m eagerly awaiting the release of Joanna Gaines’ (of HGTV’s Fixer Upper) new furniture line which is to be out in the next month or so. I’m slightly obsessed and dying to see what she’s created! I have a few girlfriends that are always decorating and re-decorating along with me so it seems we’re always passing ideas back and forth. From paint to wallpaper and renovating kitchen’s (I’m in the middle of designing one with a friend at the moment and hoping she’ll let me share details once it’s complete!) and everything in between. I love playing around with every last detail. That leads me to today’s topic of rugs. 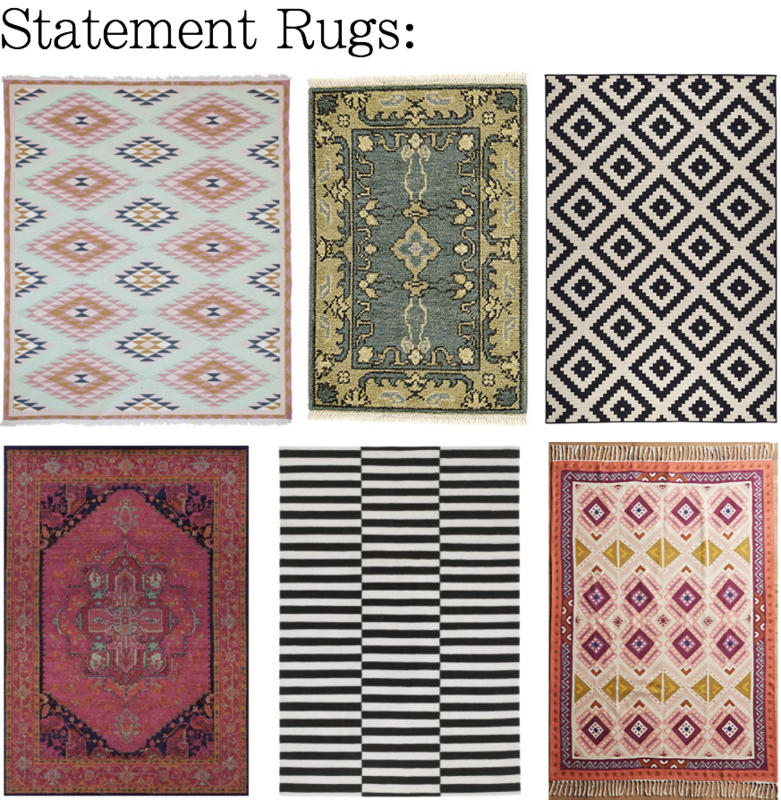 I’ve already tackled 3 rugs for our home and I still need 2 more that I haven’t figured out just yet. I always go back and forth on whether I want a beautiful rug that makes a statement or a soft neutral that will blend in subtly with the space. I’ve done some of both so far (neutral for the family room and bold in the dining room and my husband’s office). Needless to say, I’ve spent my time scouring the internet. 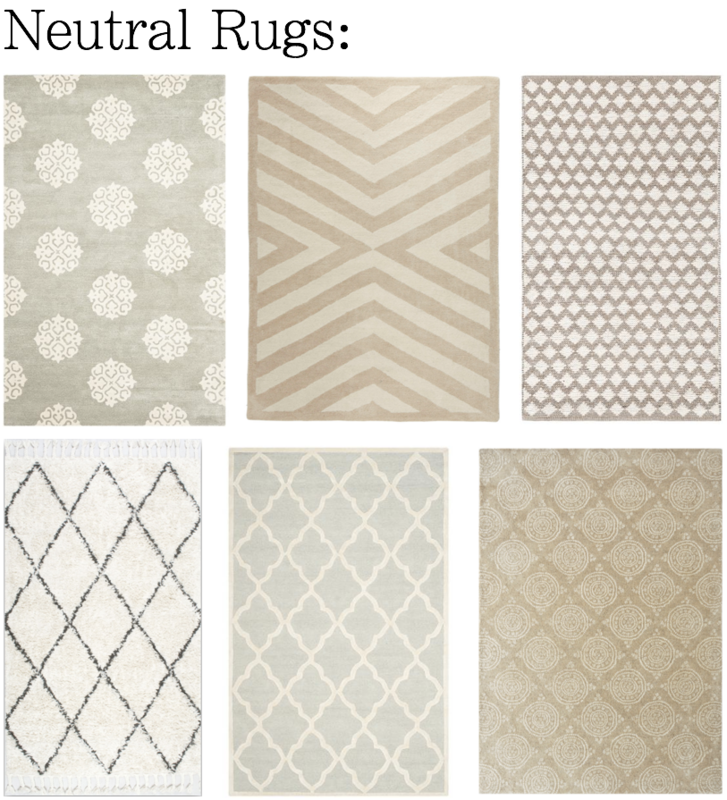 So today I’m sharing a dozen of my favorite neutral and statement rugs. For me personally, I love neutrals for living rooms and bedrooms. And it can be fun to play with statement rugs for playrooms (see #3 and #5), offices (we used #3 in my husband’s and it’s perfect), nurseries (see #1 and #6) etc. The fun part is that there are no rules when it comes to rugs. You can do whatever suites you and your lifestyle. What are your thoughts on the matter? Do you tend to lean one way or the other? 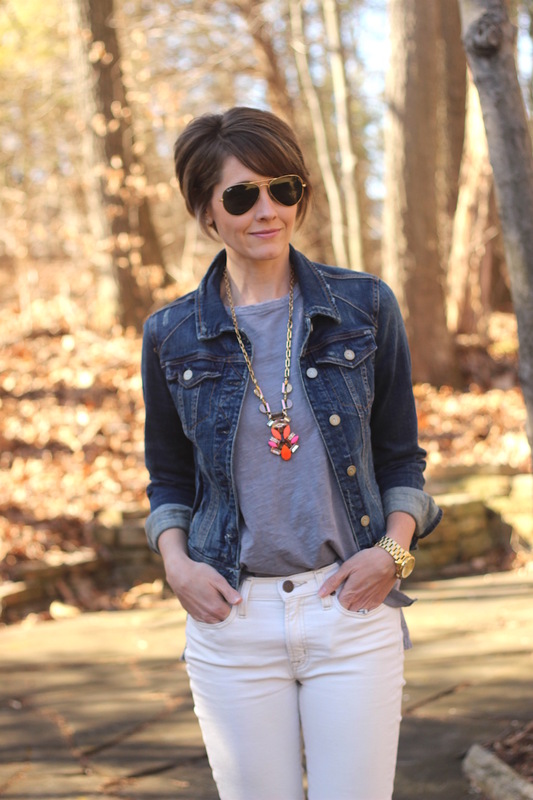 Alright ladies, today is the second installment in our Talking Basics series (you can see the first featuring the basic white tee here) and we’ll be tackling denim. In some ways it can be a real love/hate relationship…do you feel that way? 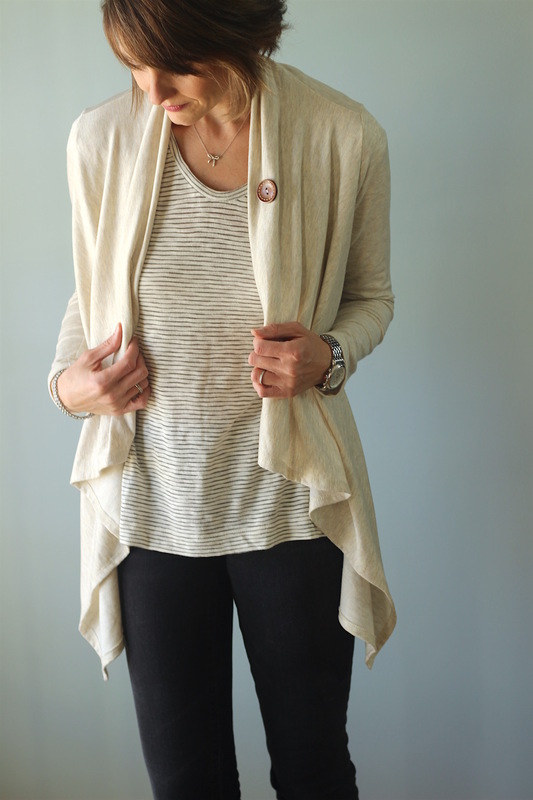 I love it because it’s a great neutral and a wardrobe staple. Kind of like hardwood floors in decorating. When you have a great base it’s much easier to put an outfit together (or decorate a room, see what I mean?). In another way, finding the right brand, fit, style, color that suits your shape and style can be a real time consumer. I’ve been there and continue to find myself there time and time again! 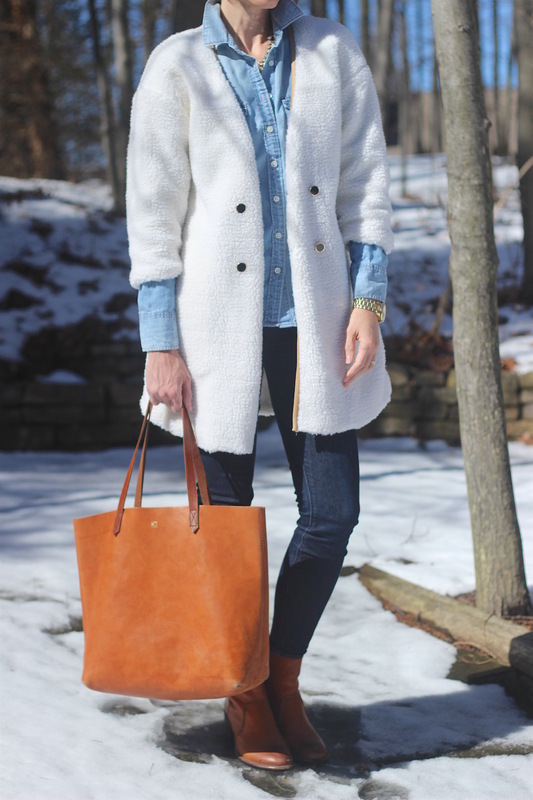 Let’s start by covering the basic styles of denim. You have skinny, straight, boyfriend and flare. 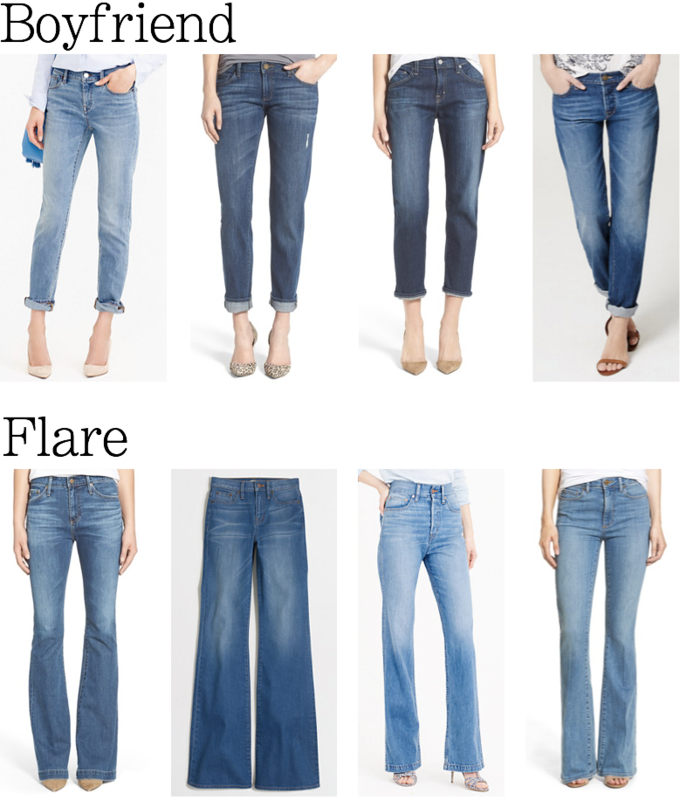 You can also throw in the legging which is basically super skinny, and bootcut which falls between straight and flare. Those take me back to my high school days and I’m honestly not a huge fan of bootcut, so for now I’m just going to set them aside. 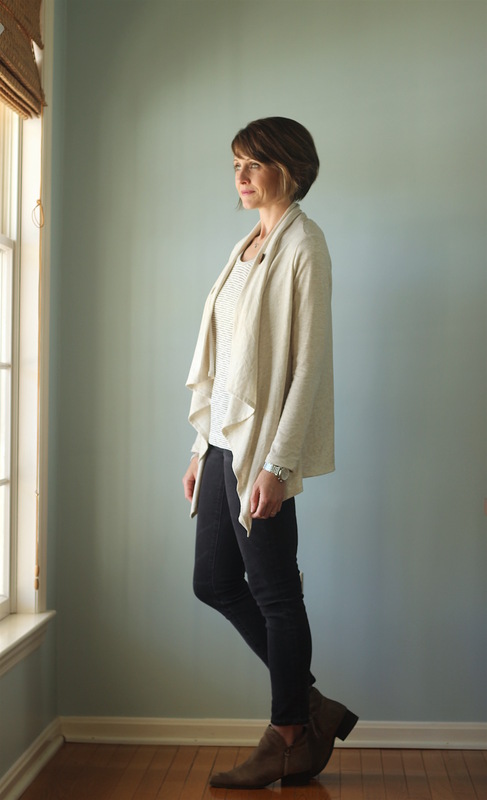 Outside of the basic styles you’ll also have to decide what wash you are looking for (light to dark and everything in between), what rise (high, mid or low), and if you want any distress to them. All of these choices are very personal and come down to what you feel the most comfortable in and how you’re looking to wear them. I know a lot of others have luck with Citizens of Humanity and 7 For All Mankind, it’ll just depend what fits your body the best. As I recommended with the basic white tee’s, if you don’t have certain retailers nearby, try ordering from Nordstrom or ShopBop or someone that offers free shipping and returns so that you can go to town ordering a number of different brands/styles/sizes etc. 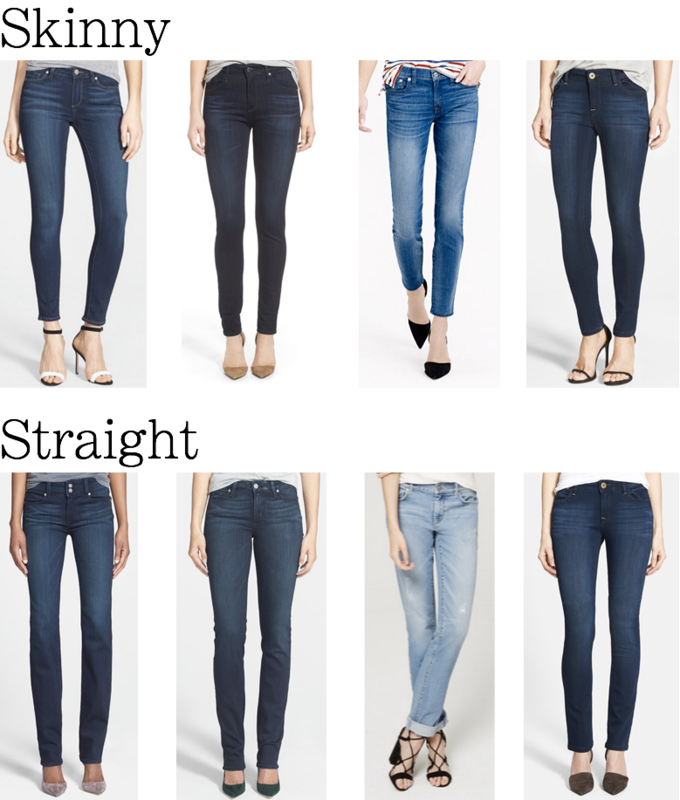 I like to have at least one pair of the following styles and typically more because I find I lean towards light denim for a while and then switch over to dark. There’s not really a right or wrong there. The same goes for the rise. I have never been a fan of low rise because I always ended up having that dreaded gap above the behind! Thank goodness mid and high rise is the current trend. I finally feel comfortable and plan on keeping it that way even when low decides to make it’s comeback! So how’s your relationship with denim? What’s your go-to?